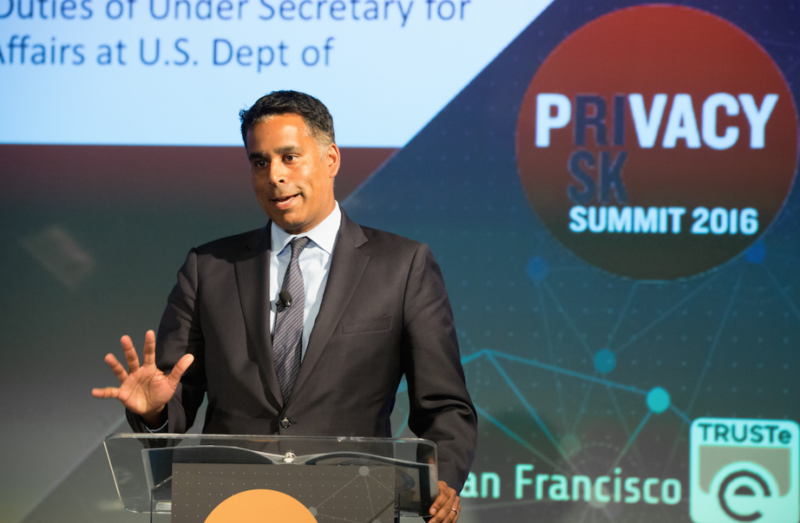 250 privacy professionals converged in San Francisco this week to discuss the challenges they face in managing emerging privacy risks and share strategies for success. They enjoyed a packed day of inspiring keynotes, expert panels and, of course, networking acquiring new ideas and practical advice to take back to the office. The TRUSTe Privacy Risk Summit brought together over 50 speakers across 24 sessions and 4 parallel tracks. A highly engaged audience was captivated from the start by a culinary-inspired keynote from Hilary Wandall at Merck & Co., Inc. “Deconstructing the Privacy Risk Dish” to a personal and historic perspective on the new EU-U.S. Privacy Shield from Justin Antonipillai, Counselor to the Secretary Penny Pritzker after two years as the co-lead U.S. negotiator with the European Commission. Chris Babel, CEO TRUSTe kicked off the Summit and explained how this event builds on the success of previous TRUSTe events, the EU Data Protection Conference and the IoT Privacy Summits in 2014 and 2015. Adam Sedgwick and Sean Brooks from NIST were joined by Dan Caprio and Jonathan Litchman Co-Founders of The Providence Group to discuss the NIST CyberSecurity Framework and its role in managing privacy and data risk. Lively discussions and networking continued in the halls outside the breakout rooms. Josh Harris, Director of Policy at TRUSTe and Hilary Wandall AVP & Chief Privacy Officer, Merck & Co., Inc. spoke about an accountability-based approach to global frameworks and local laws. Attendees heard from Paul Plofchan about how ADT had used privacy technology to streamline their ongoing privacy risk management and provide visibility to senior leadership. Justin Antonipillai delivered the closing keynote on negotiations with the European Commission on the EU-U.S. Privacy Shield. Thank you to our speakers, sponsors, partners and our team of volunteers from WISP and the University of California, Hastings College of the Law. This event would not have been possible without your support! To read about future TRUSTe events, visit our upcoming events page or subscribe to the TRUSTe blog.